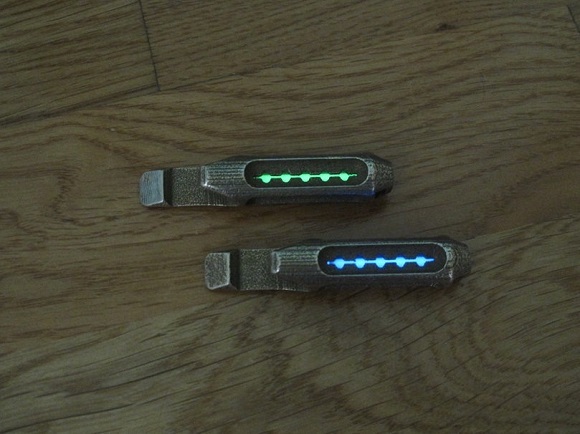 A Multi-Functional Tritium Lantern (or just MFTL) is the kind of device that triples into a bottle opener, a mini pry tool and a miniature flashlight. It goes as a keychain, so you will have it with you wherever you go, if you don’t forget it of course. The device was produced by maker from Athens, Greece. And he regards it as the “Next Industrial Revolution” – he means the use of additive manufacturing or 3D printing to create it. 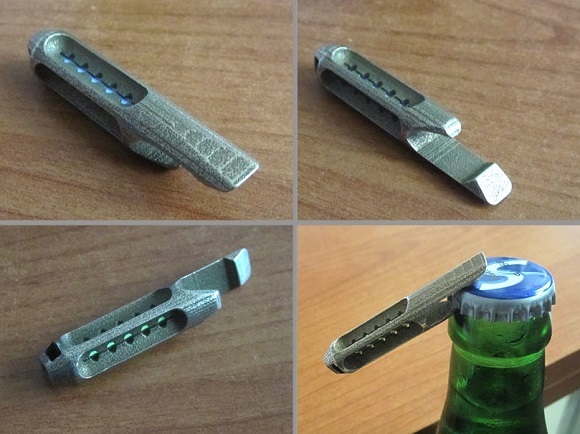 It is digitally sketched and then 3D printed from stainless steel – 420 stainless steel alloy and 40% infused bronze. It reminds of a cigarette in shape, but slightly shorter. Etsy Shop, InnovoDesign offers each device at $63.58. The designer confessed that he loves creating unique, innovative, functional artefacts and objects. You will probably agree that there is something mysterious and a shade of retro style in the device. The quality of stainless steel and the form of the gadget are reminiscent of the Art Deco style. The real marvel, in fact, is the unique features of the device. It gleams in the dark. 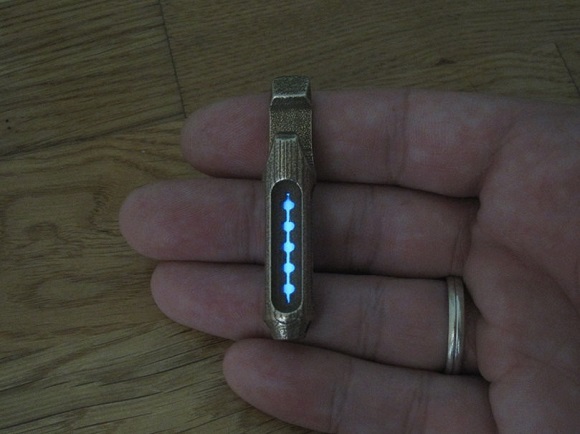 When the designer receives his 3D printed things from Shapeways, he fixes a non-removable tritium isotope into each piece with a 22.5×3mm in phial for each. The phial is pitch and it can’t be easily broken or removed, as it is thoroughly embedded into the steel body, so don’t worry about leaks. 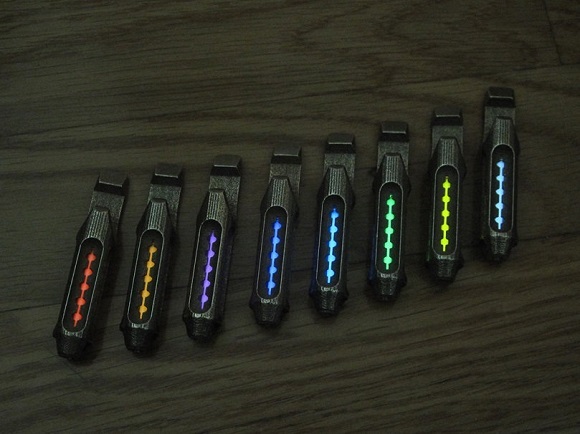 There are eight colors for you to choose in which your device will glow. 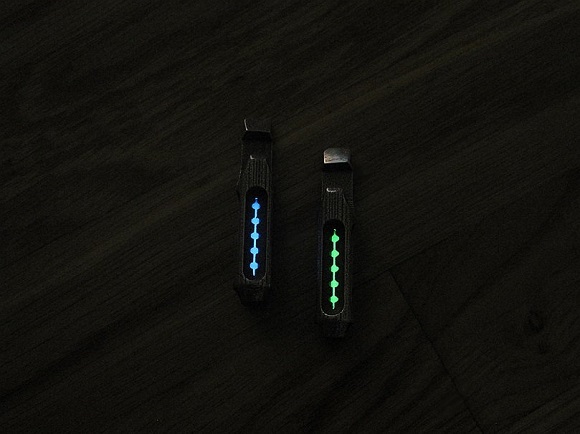 There is also a large tritium light – a beacon – that triples the glimmering of the small vessel flashlight-opener-pry tool. 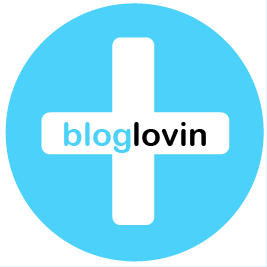 Tritium-symbol 3H or T, also known as hydrogen-3, is the hydrogen radioactive isotope. At the market one gram of tritium is sold at $30,000. That explains the price of the InnovoDesign MFTL gadget at nearly $65. We suppose they are worth the price. The phials are sealed hermetically and are nice small sources of light owing to the tritium isotope. It glitters and there’s no need to charge the light, which is more common with the majority of glow-in-the-dark phosphorescent articles. In the well-lit places and in the daytime the flow is invisible. But when there is not enough light the device will be your own small light. Not without honor does the creator say that is a genuine nuclear-powered device.